Alan's strolling magic is perfect for cocktail parties or receptions. He performs his magic in the hands of your guests, using cards, coins, jewellery and other magical props. This intimate style of performance allows the flow of the party to move uninterrupted and is an excellent ice breaker. This will get people talking and laughing adding a sense of fun to the function. Walk around magic is great at events where guests are standing and engaging in multiple conversations and help to create an atmosphere of excitement. 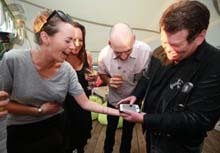 Alan is an international award-winning professional magician who is based in Auckland, New Zealand. He is the only New Zealand magician who is both a Global Member of the famous Magic Castle in Hollywood USA where has performed more than 100 shows. Alan is also a member of the prestigious Magic Circle in London where he holds their highest degree of Member of the Inner Circle with Gold Star. I would like to express my thanks to you for the two performances of strolling magic you carried out here at the Travelodge. Both occasions were very successful with many of our guests commenting on your flair and talent. I was especially pleased with the atmosphere you created in our outlets as you wandered from venue to venue. It certainly added a touch of sparkle and wonderment to our guests evening, and many of our regulars are still commenting upon it. Again Alan, many thanks for your efforts and I look forward to welcoming you back to the St Kilda Road Travelodge in the future. Please find attached payment for the fantastic job you did at our National Millionaires Function on Thursday 12 August. Your strolling magic show went down well with some excellent feedback. Your talent and time was much appreciated.